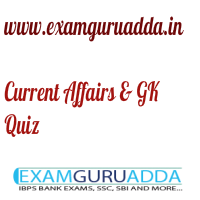 Dear Readers Examguruadda.in presents Current Affairs quiz of 27-28 November 2016 that cover important current affair events. Current Affairs quiz prepared according to the latest Bank, SSC and other competitive exam. 1. The National Milk Day (NMD) is celebrated on which date in India? 2. Who has been appointed as the new Chief of Army Staff (COAS) of Pakistan? 3. Which Indian state will become the first state in India to go cashless? 4. . India’s first digital and cashless village “Akodara” is located in which state? 5. Who became the third Indian boxer to clinch gold medal at the AIBA Youth World Championships? 6. Which Indian film has been invited for a special screening at the UN Headquarters? 7. Name the noted Marathi author and Sahitya akademi awardee who passed away recently? 8. Who won the women’s singles title of 2016 Hong Kong Open Super Series? 9. India’s first underwater festival has been held in which city? 10. The 2nd edition of Judima Festival will be hosted by which state?